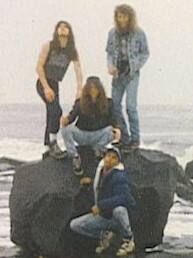 EXMORTIS was formed in mid 1987 by guitarist/vocalist Brian Werking who recruited ex-bassist Chris Wiser. After a few short months of continuous rehearsing, Exmortis tried out vocalist Mike Simons. He seemed to fit the style that Exmortis was looking for so they kept Mike in the band. He brought kind of a Kreator style vocal presence to the band which Exmortis seemed to like. 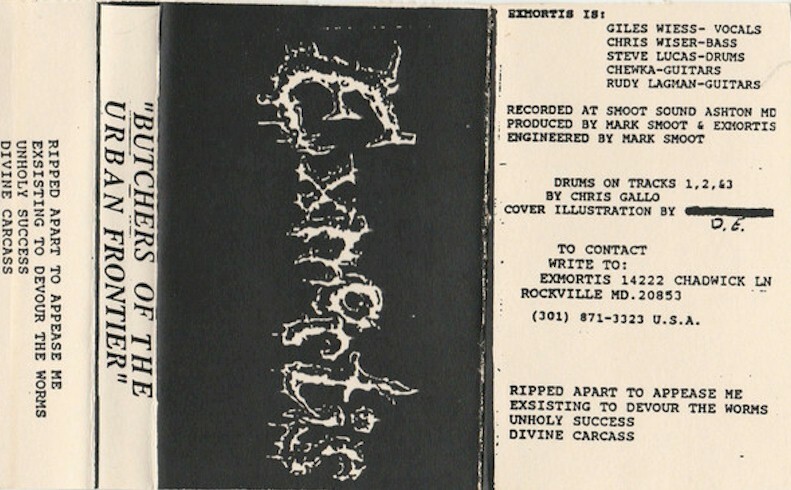 In July of 1988, Exmortis entered the studio to record their “Descent Into Chaos” demo which was only 3 tracks but what a demo it was. Releasing the demo was just the beginning. 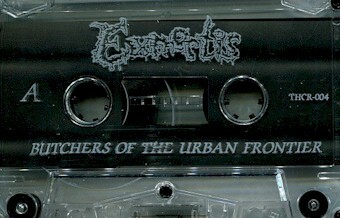 During this time Exmortis began playing live shows and increasing the awareness of this bands pure power and aggression to the public. Within months, Mike Simons was released due to a lack of interest in the music and Brian Werking began chanting the words for Exmortis. 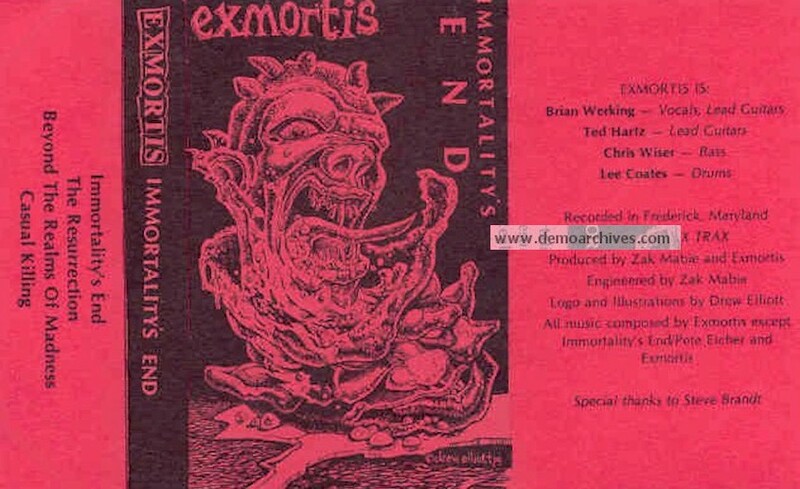 In February of 1989, Exmortis released their second demo titled “Immortality’s End”. 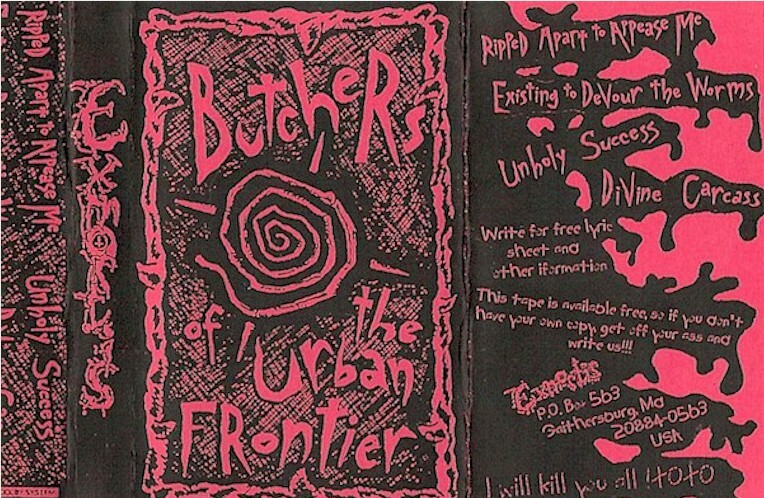 This demo had four tracks including a spooky intro composed by Pete Eicher. These four songs were aggressive and technical with many timing changes throughout. The Exmortis style of Death Metal was finally born. 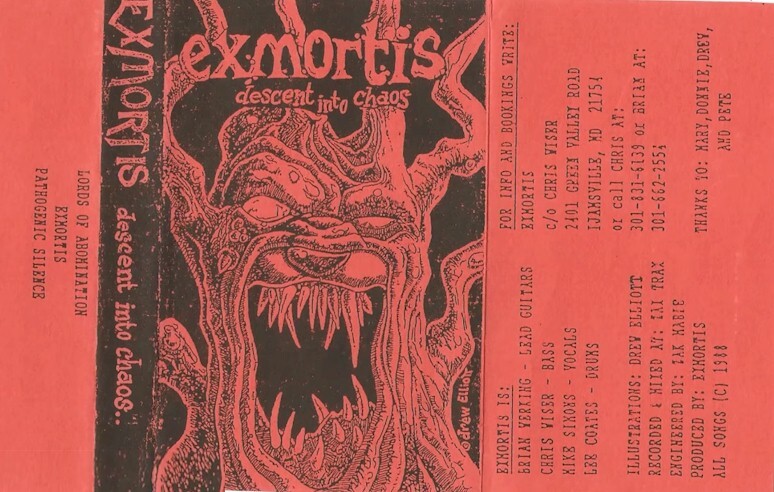 Some time around the middle of 1990, Exmortis was no longer able to practice due to reasons beyond their control and were forced to cease their existence for a time. Everyone in the band went their separate ways. Aantar Lee Coates and Ted Hartz separately moved to Tampa, Florida, Brian Werking moved to Pittsburgh, Pennsylvania and Chris Wiser stayed in the Washington, D.C. area. Unbeknown to anyone Brian began dabbing into computers and with his drum machine started writing new material for an upcoming third Exmortis demo titled “Dreams Of The Dead”. Fully capable of composing all instruments himself, Brian planned to release this demo without help from studio musicians. There were three songs prepared when he was contacted by Rage Records out of New York. Once discussions were through Brian decided to let Rage Records release the third demo on a vinyl 7 inch EP which he titled “Fade From Reality”, featuring only two of the three songs prepared for the demo. The track list was “Dreams Of The Dead” and “Fade From Reality”. 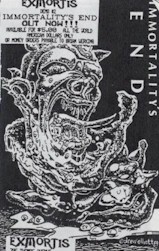 The “Fade From Reality” 7 inch EP was released in October of 1991 and received an enormous amount of publicity throughout the underground. After the Growing Deaf release Brian took a break to attend college and in 1997 moved to the Tampa, Florida area. Third Cover. Thrash Corners Release which is illegal and unauthorized. Pro made covers. Pro printed cassettes.